In the Spring of 2012 I obtained several 24 inch diameter used steel disks from a farm implement dealer. 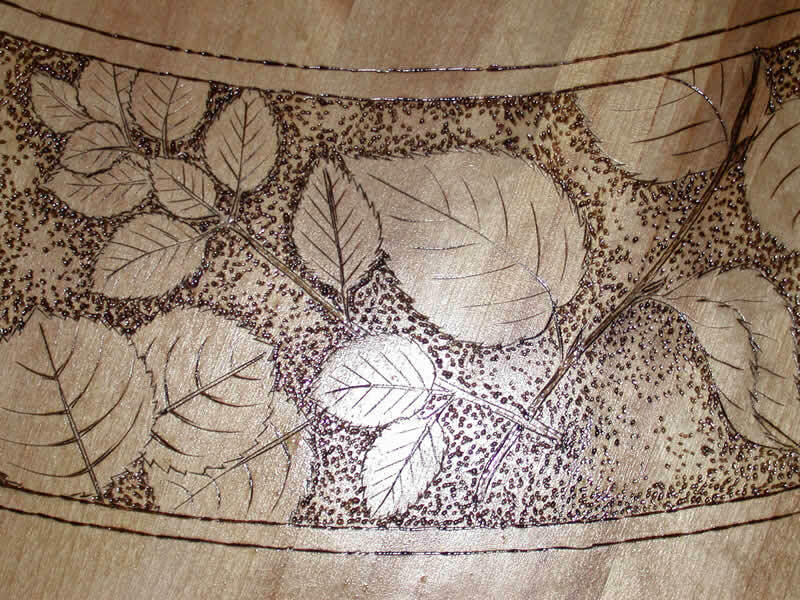 They were destined for a scrap metal sale. I also obtained sections of 4 inch diameter steel tubing which I had welded to the disk plates. 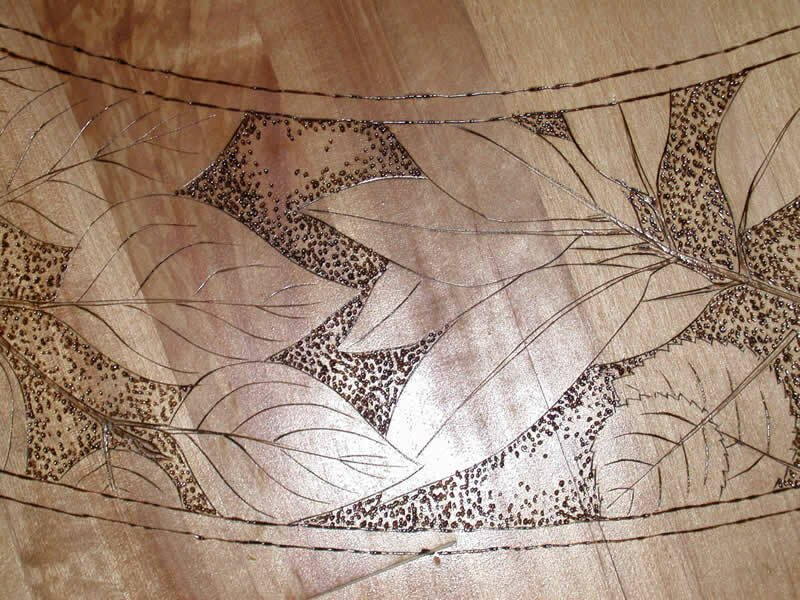 After a lot of brushing and sanding I painted the steel sections black. These have served as a good base for a coat tree and for the diamond willow tree that I cleaned and finished for my living room. I turned a block of aspen to just fit into the steel tube and added wings to the top of the block to make the supports for a circular table. 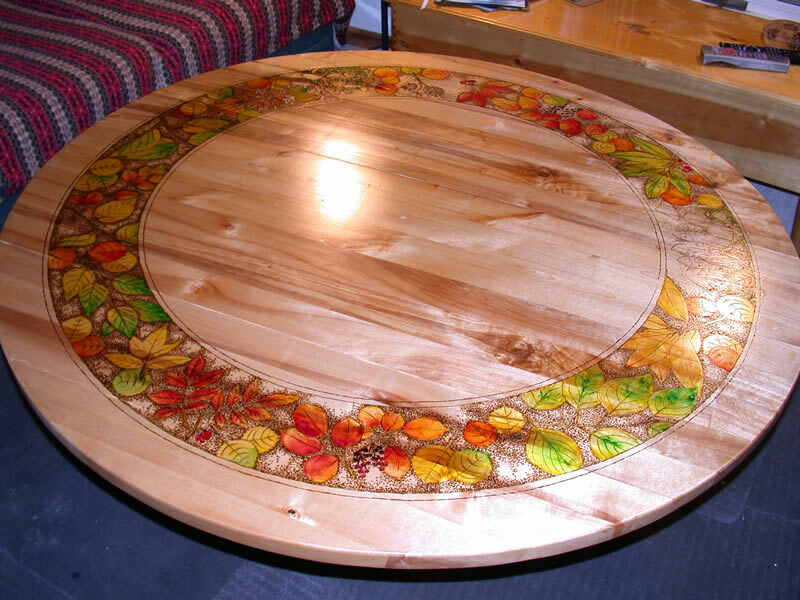 I laminated a large 4 foot diameter birch slab and cut it as a circle and attached it to the supports with special steel cleats that would allow the top to move with expansion and contraction due to moisture changes. When the warm weather came I postponed the finishing work to the next winter (2012- 2013. 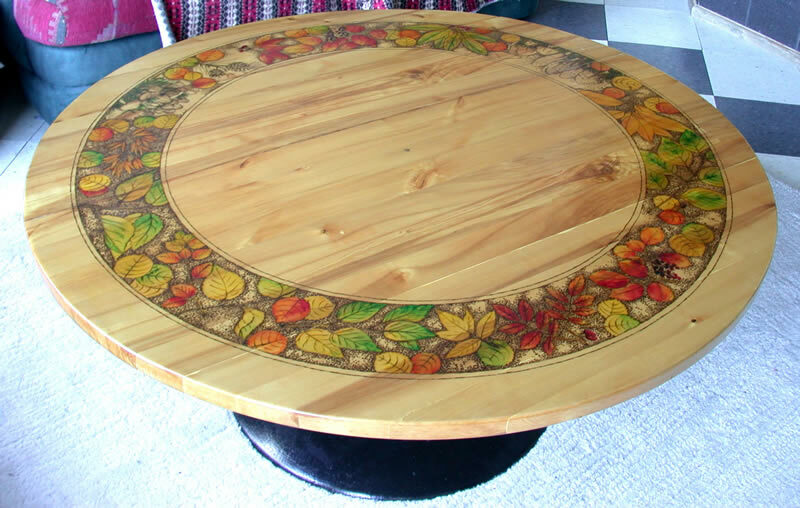 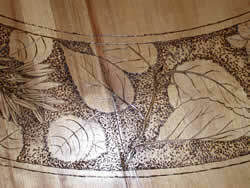 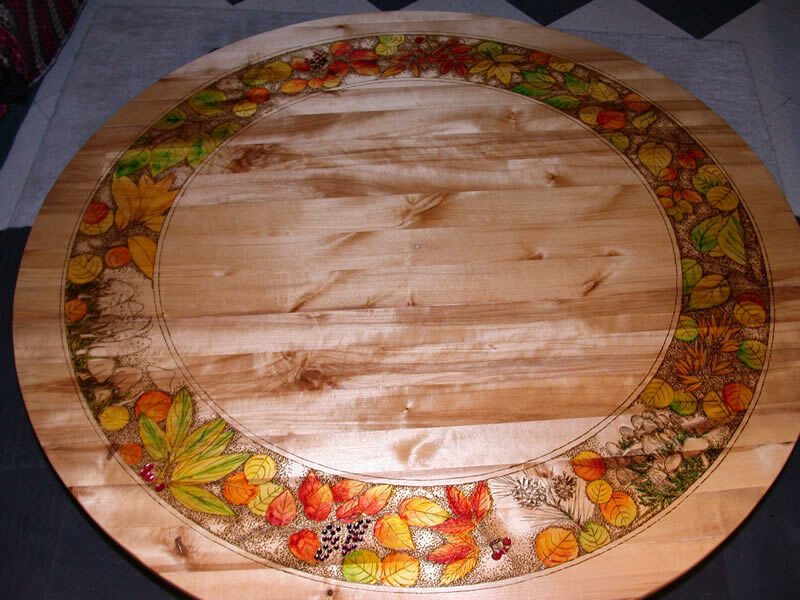 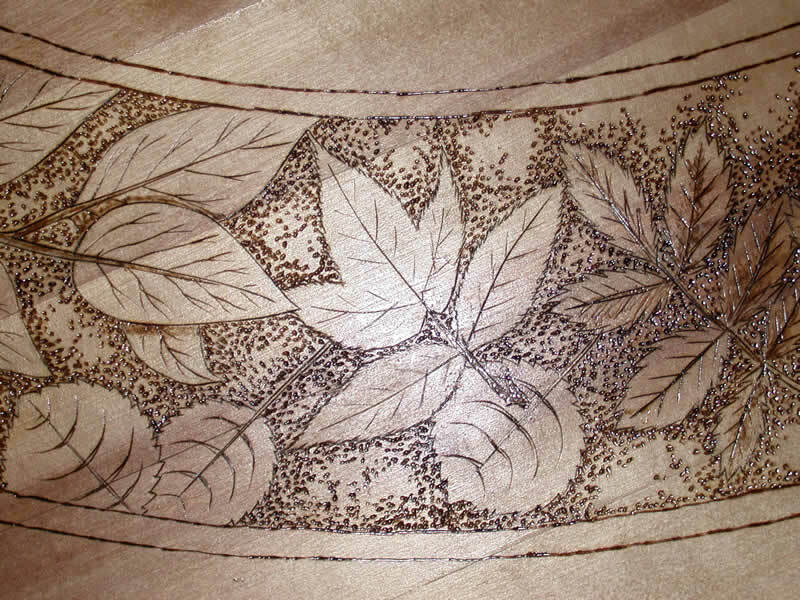 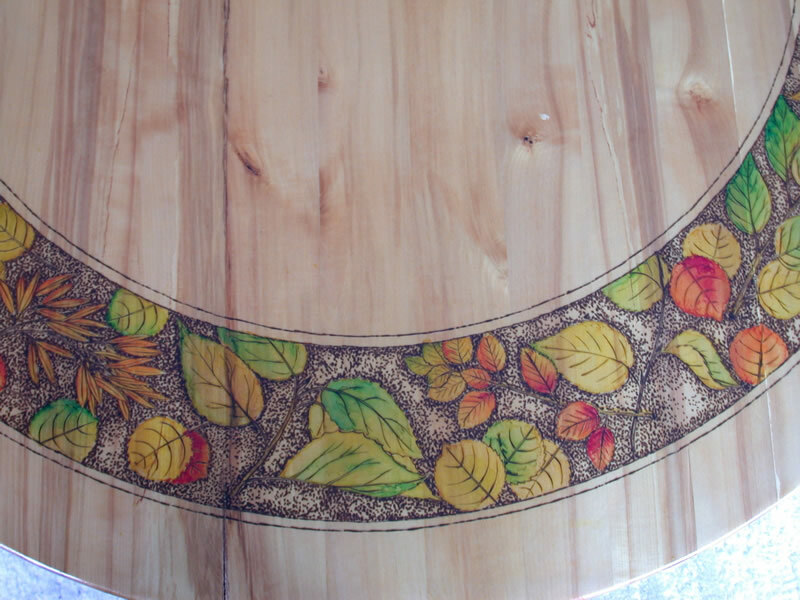 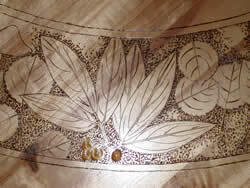 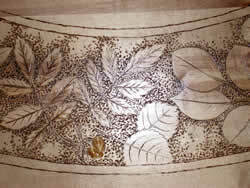 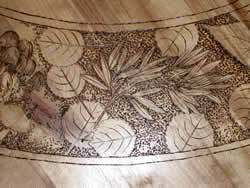 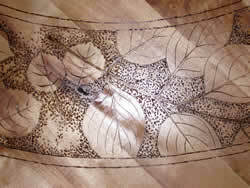 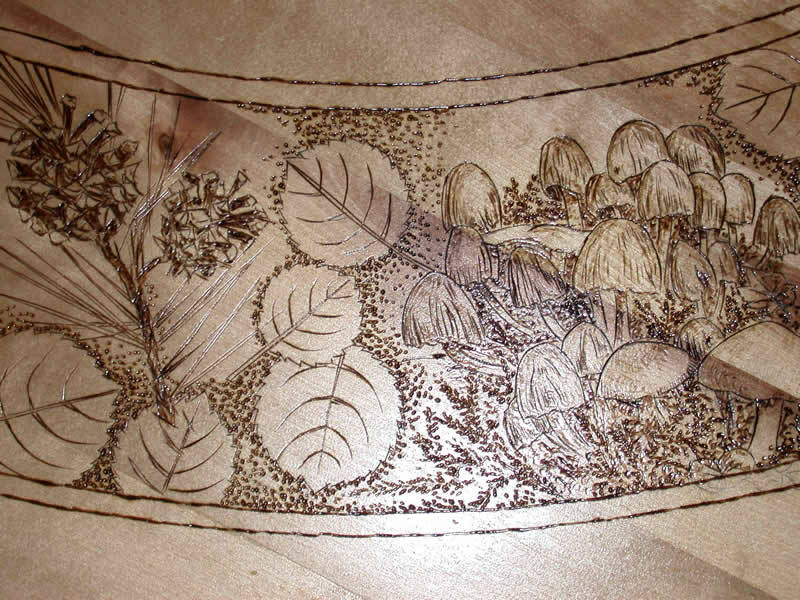 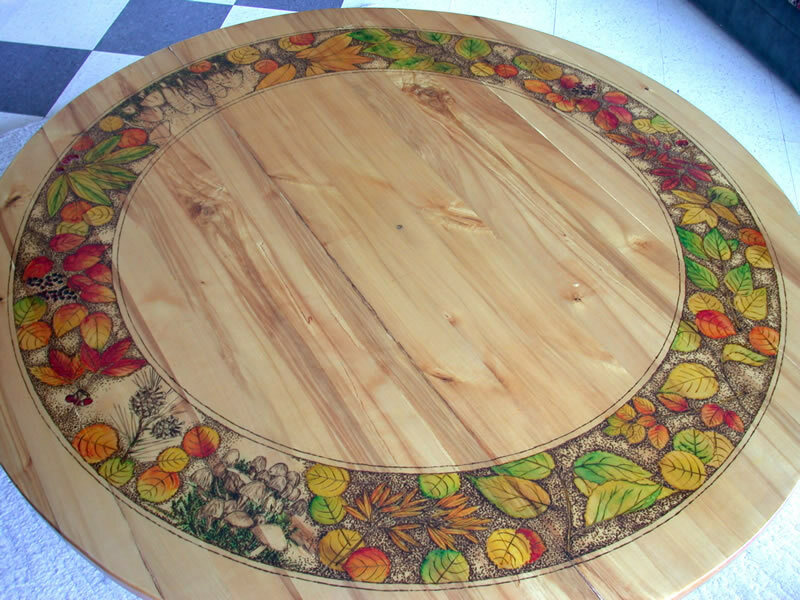 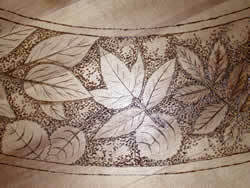 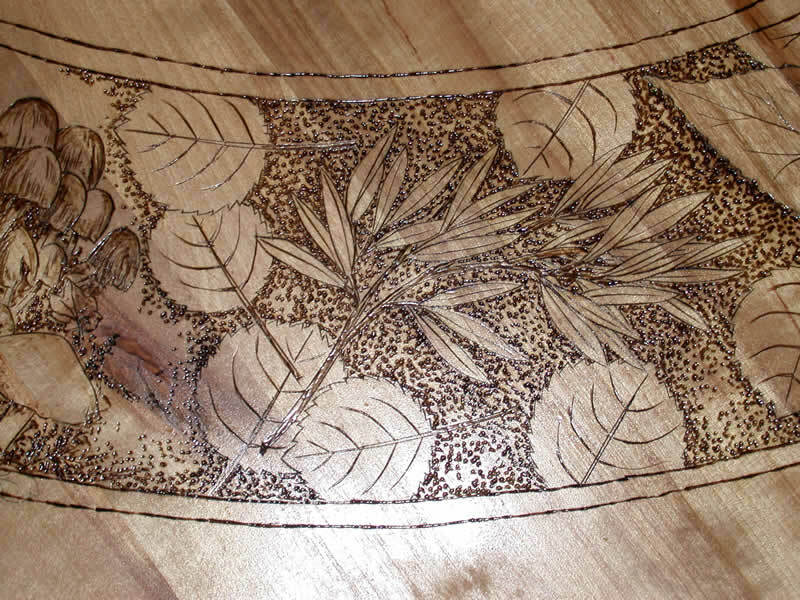 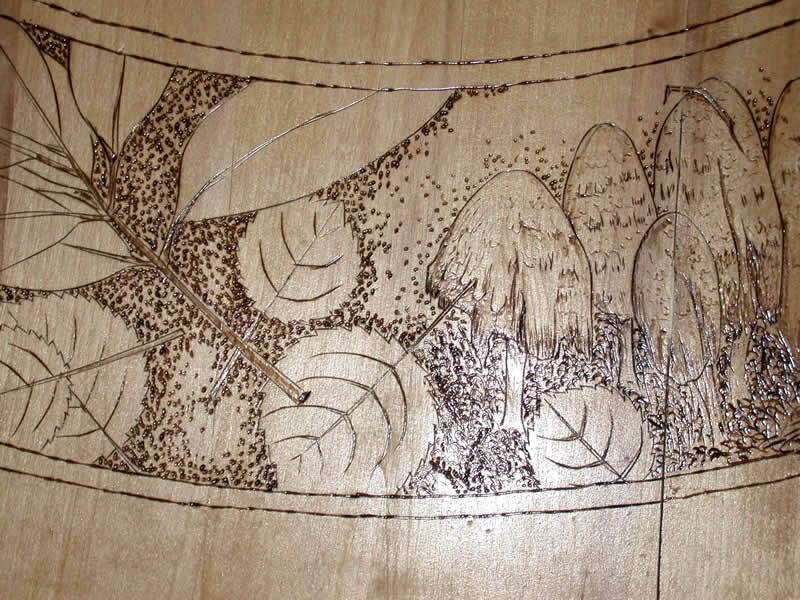 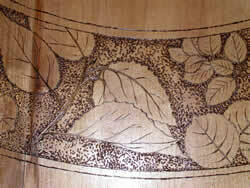 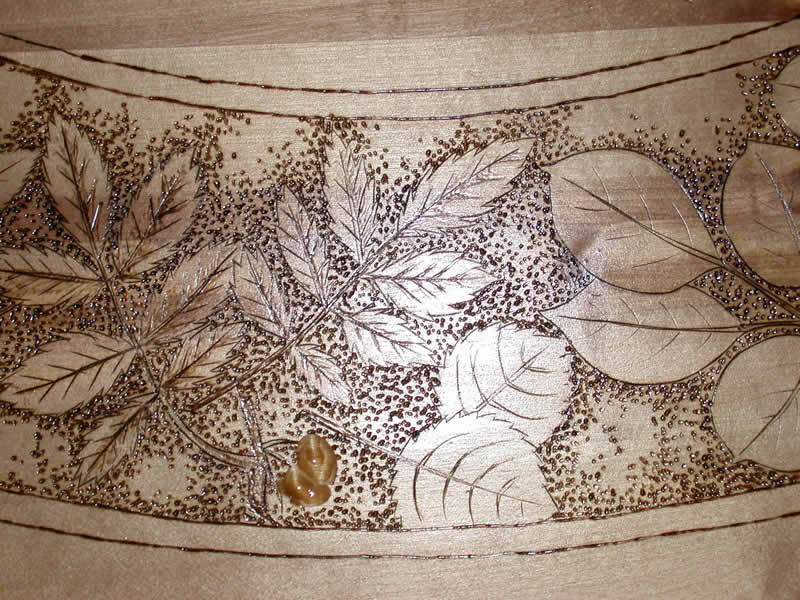 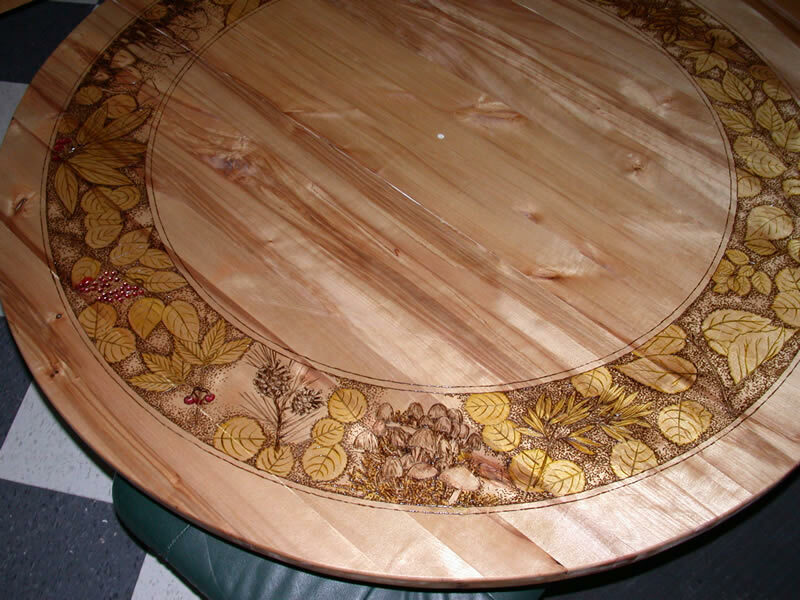 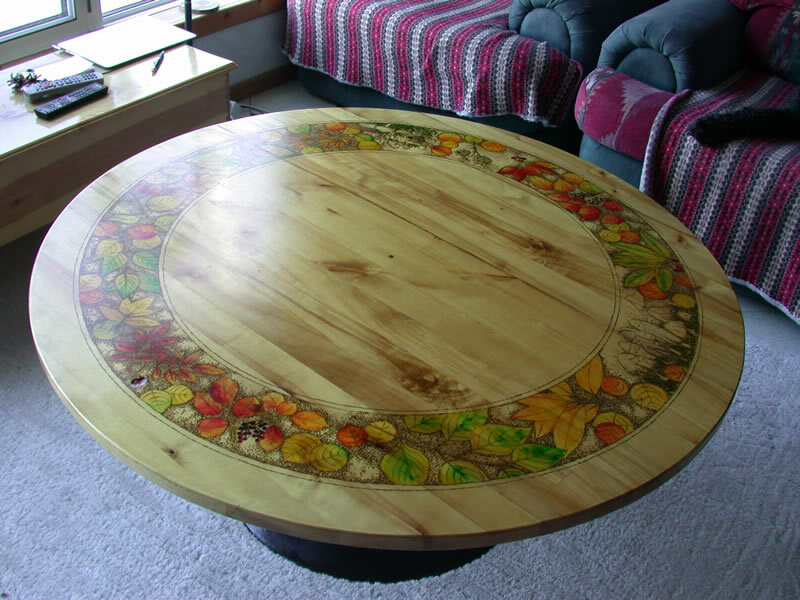 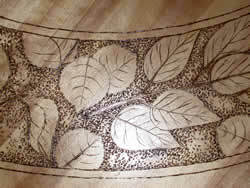 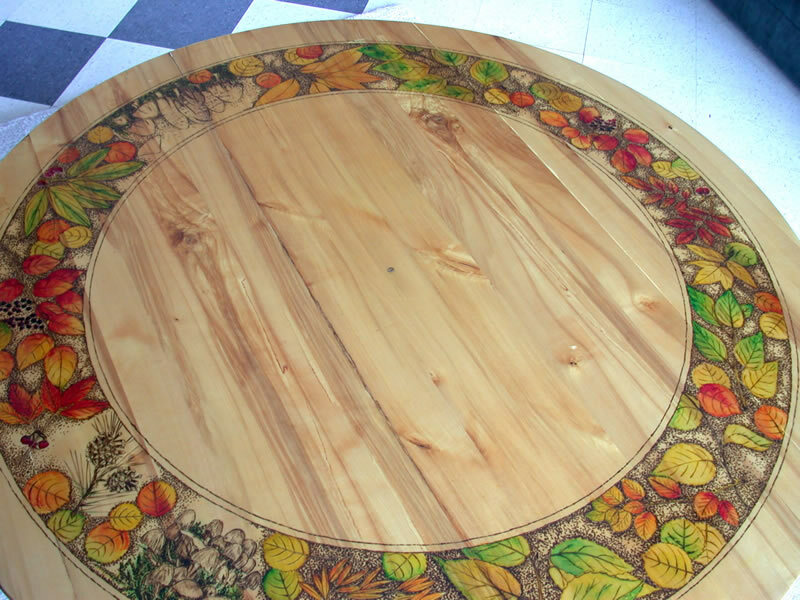 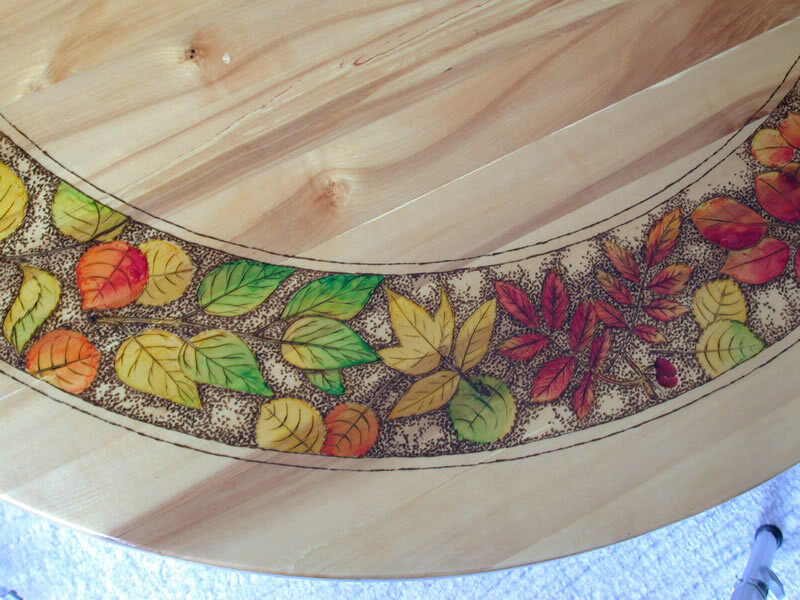 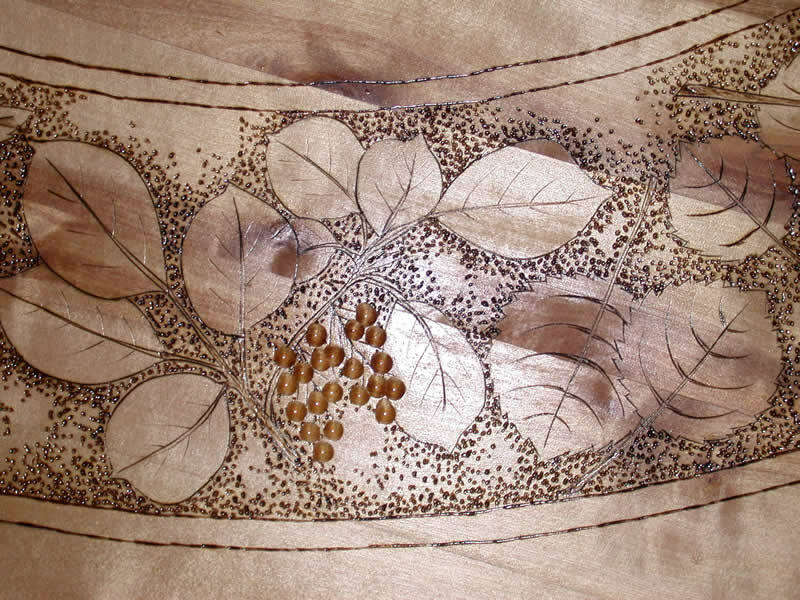 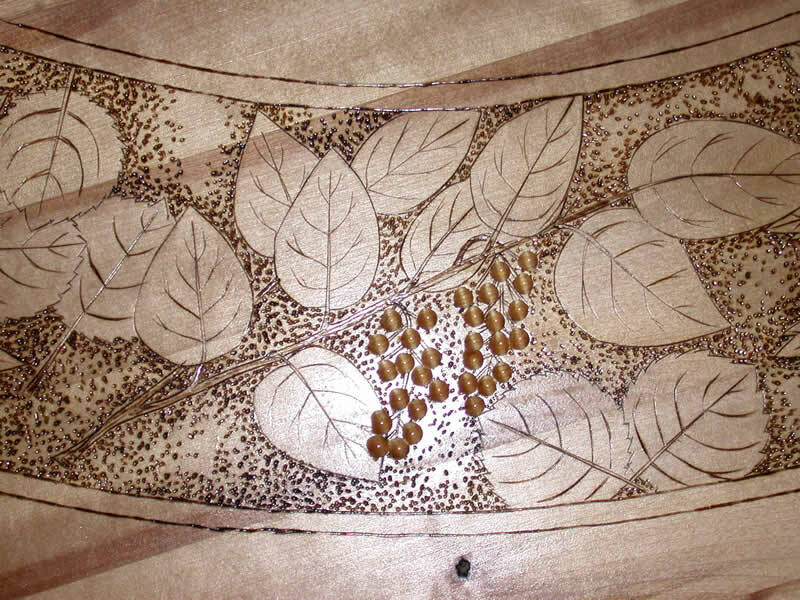 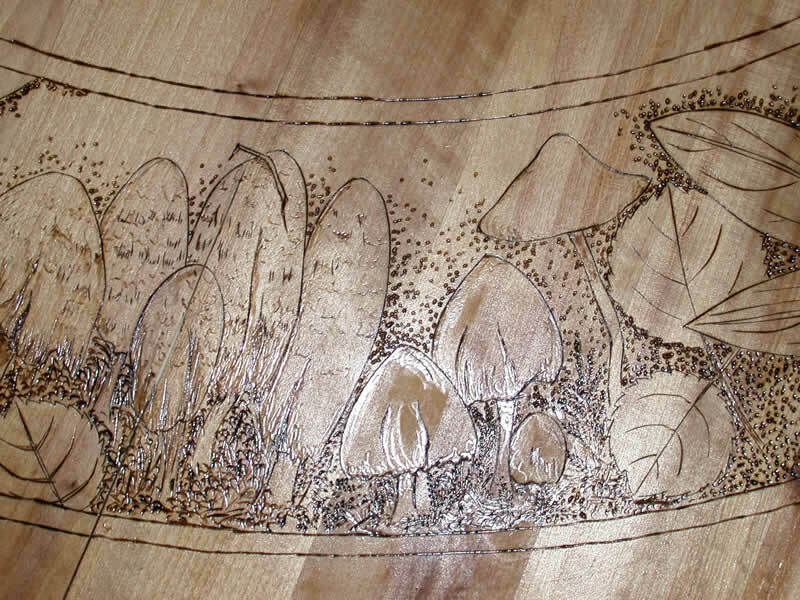 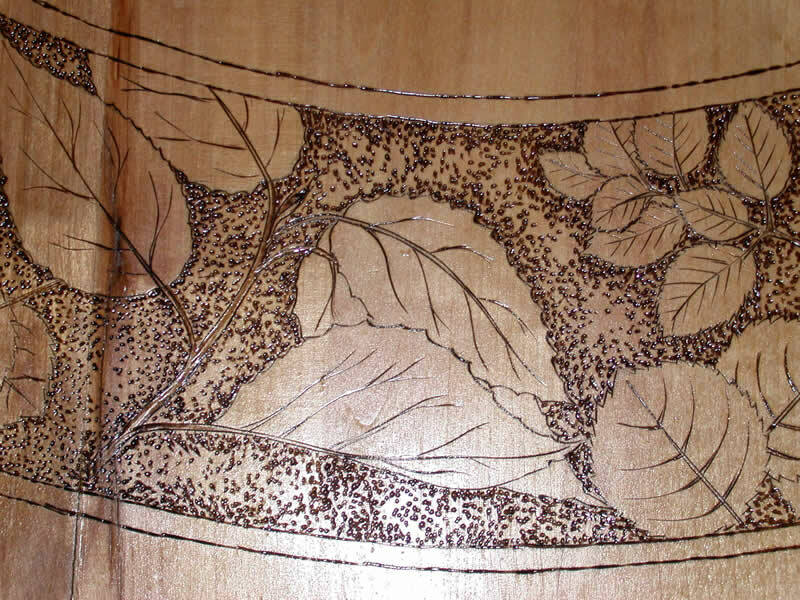 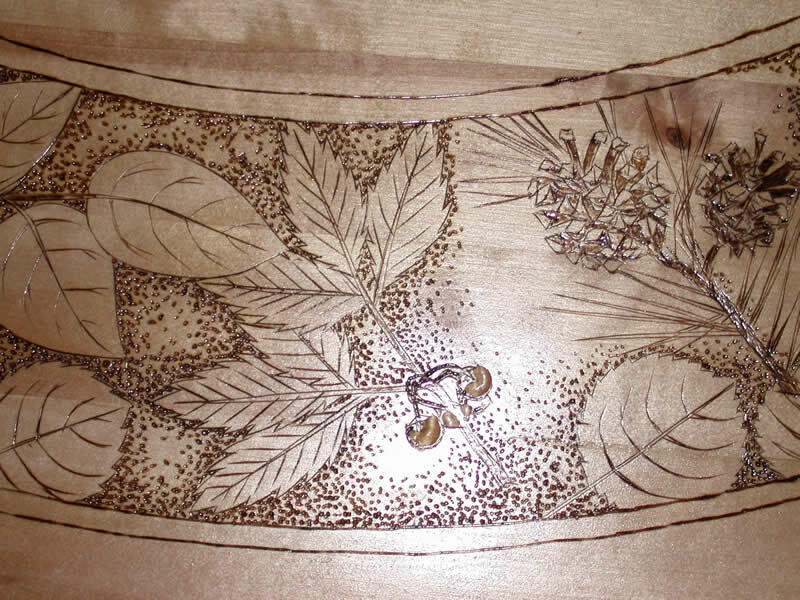 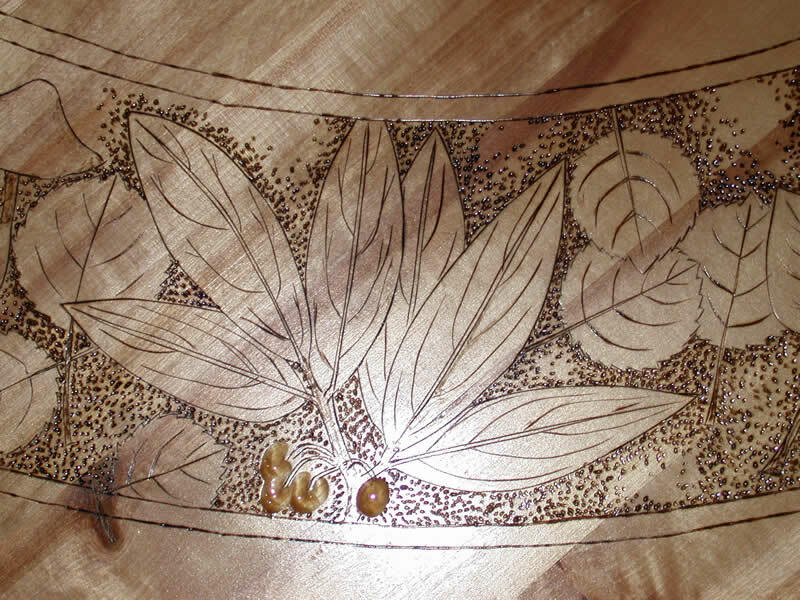 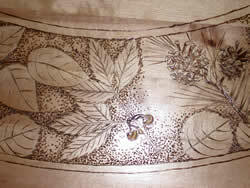 I had pressed leaves of various forest plants and used these as models to add pyrographic plant images to a circular band on the table top. 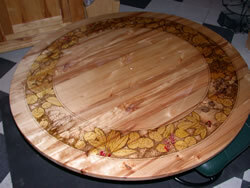 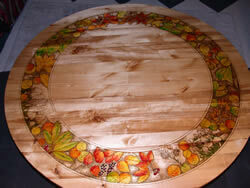 When the images were added, I applied a sealer coat of Varathane, oil based varnish. 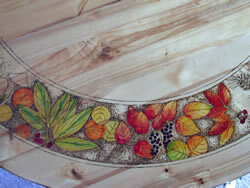 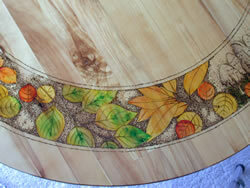 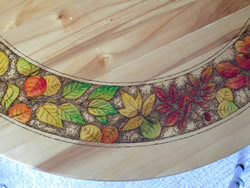 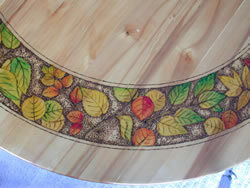 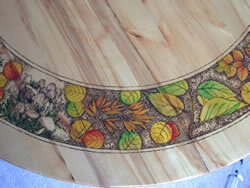 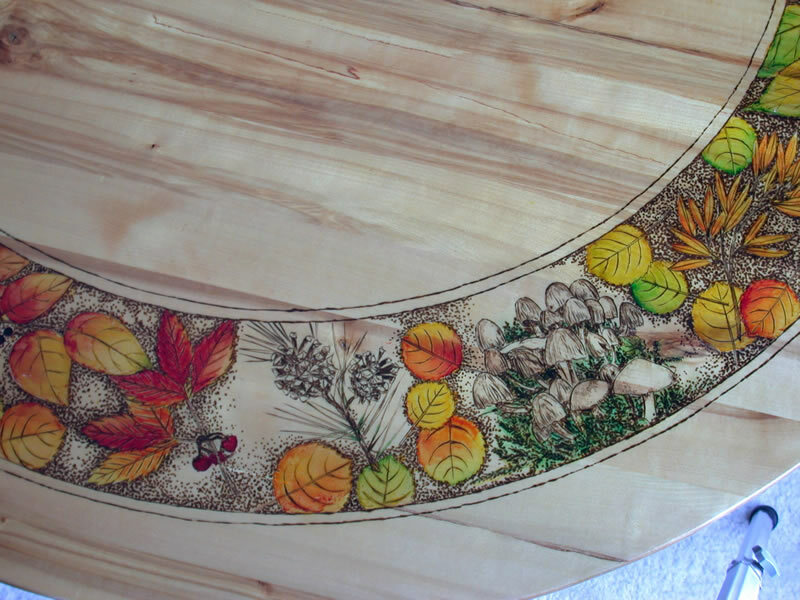 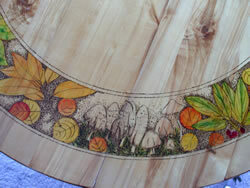 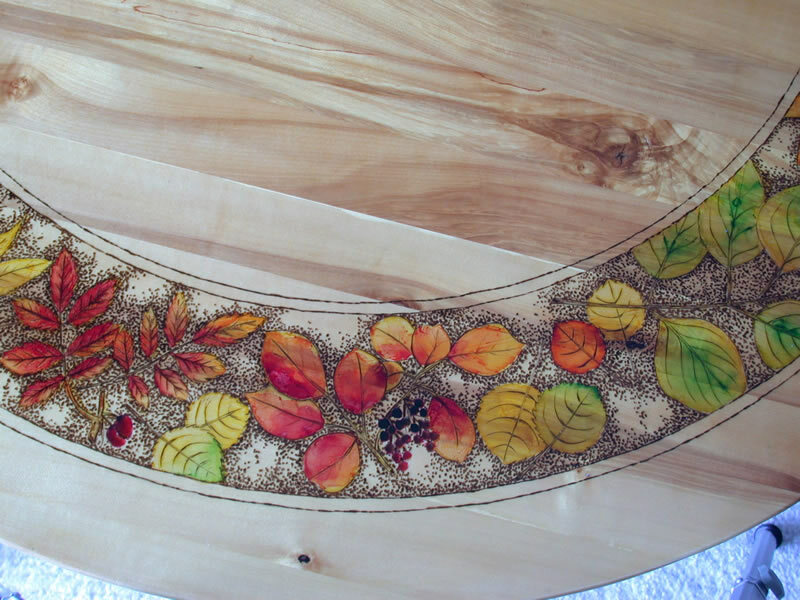 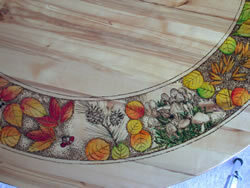 Then, using alcohol-based aniline dyes I added fall colours to the leaves with the result shown here. I have applied 12 additional coats of this satin varnish and will leave it to cure for at least a month, and probably longer, before doing a "rubbing out" finish to the surface. 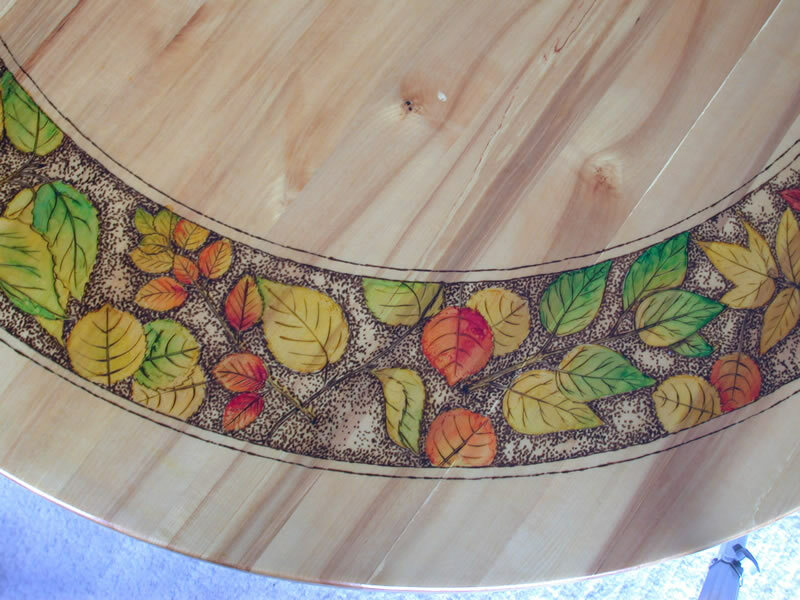 This table was designed for my living room space and I intend it to remain there. 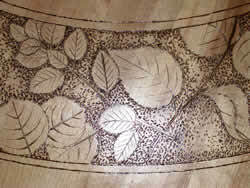 I show it here to illustrate the technique and the kind of work I do. 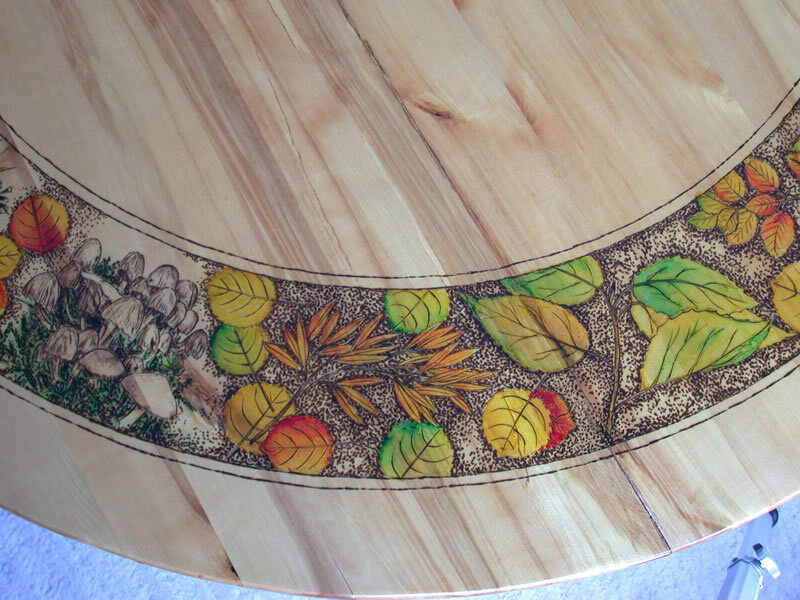 The four images above are of the whole table and the images below are of sections around the perimeter. 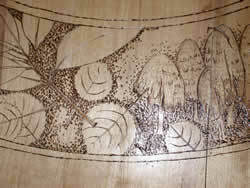 I will follow that with images of the decoration at earlier stages. 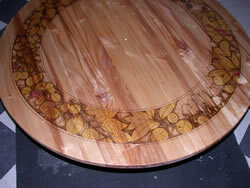 Aniline dyes are transparent and allow the wood grain to show through the colour. This gives it a quality that cannot be achieved with opaque paints. 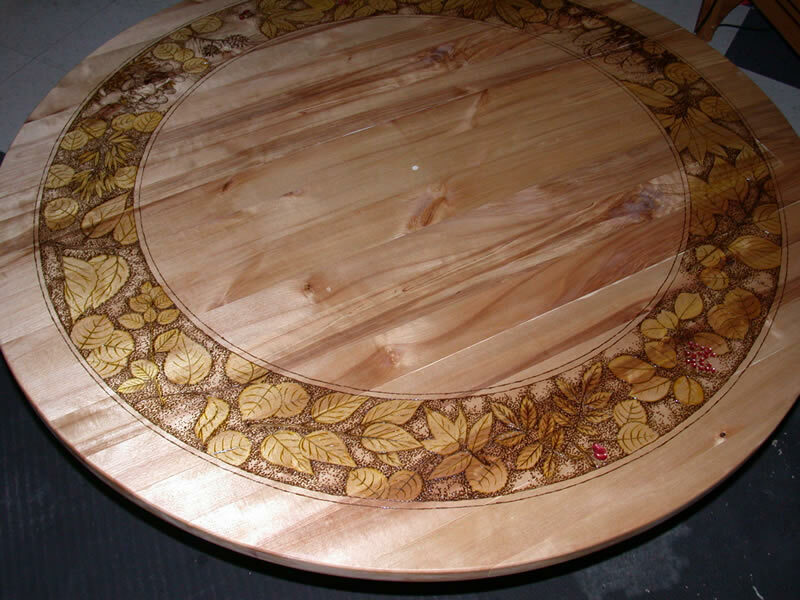 Application is by a penetration through the sealer coat of varnish which slows the absorption and prevents it from just running and spreading into the wood in an uncontrolled manner. 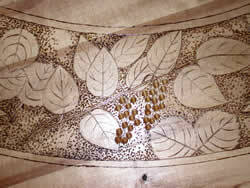 I treat it similar to water colour wash painting. 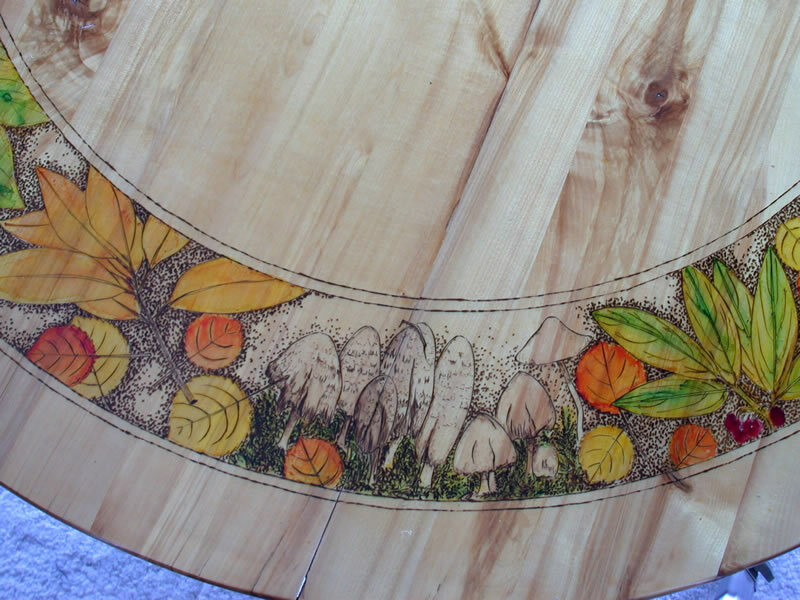 I began with a base application of yellow to most of the plant areas (except the mushrooms), and then applied orange, red and green. 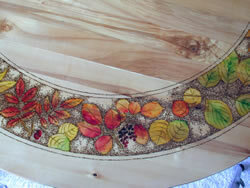 Additional yellow in a loaded brush or clear alcohol were added to blend colours which were dissolved once more in the new wash.
We are still in mid winter as I took the photos for this page and light levels are very low. 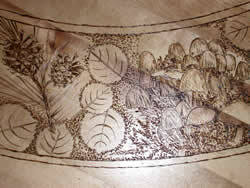 I had to use flash to obtain some of these images on this page and the quality is less than they could have been in a natural light setting in the summer.